The Ring of Kerry is one of Ireland’s most popular sightseeing routes, running for 111 miles (179km) around the scenic Iveragh Peninsula, and dotted with historic sites, natural wonders and magnificent ocean views. 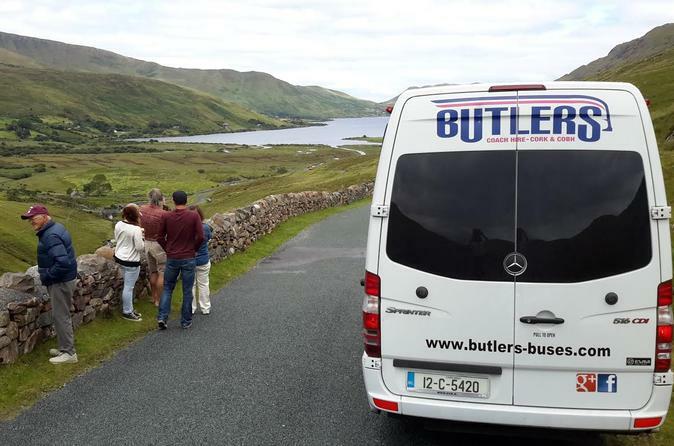 This private full-day tour allows you to escape the crowds and discover the sights that the tour buses miss, plus highlights like the Killarney National Park, Sneem, Torc Waterfall and Ross Castle. Begin your morning with pickup from your Cork hotel and relax on the journey to Ireland’s Iveragh Peninsula as you discuss the day’s itinerary with your guide. Then, get your camera ready as you set to explore the famous Ring of Kerry. The first stop is the lively riverside town of Killorglin, where you’ll have the option to tour the Bog Village (entrance not included) for a glimpse of 18th-century life. Continue along the rugged Atlantic Coast, passing the sandy beaches of Glenbeigh, the market town of Cahirciveen and the island of Valentia. As you round the southern tip of the peninsula, look out for the UNESCO-listed Skellig Islands on the horizon, stop to take photos of Ballinskelligs Castle or hop out to admire the colorful houses of Waterville village. Benefit from your private vehicle to duck off the beaten track and visit historic gems and lesser-known viewpoints. Perhaps take a short detour to admire the Staigue Stone Fort, an ancient ruin dating from the Iron Age; stop for lunch (not included) in the picturesque village of Sneem; marvel at the Kenmare Stone Circle; or pay a visit to KIssane Sheep Farm. Finally, journey through the Killarney National Park, stopping to snap photos of Torc Waterfall, the Lakes of Killarney and the Macgillycuddy Reeks, Ireland’s highest mountain range. Here, optional stops include the famous Gap of Dunloe, the 19th-century Muckross House, Aghadoe Heights and the evocative ruins of Ross Castle. After a full day exploring the Ring of Kerry, return to Cork, where your tour ends with drop-off at your hotel.